Thrifty Vaultâ„¢ sells clothing, shoes, accessories, jewelry, costumes, fragrances, and other items that may interest you. We pride ourselves on high quality merchandise and helping you shop while staying within your budget. Some items are listed at retail but we accept offers to help you better negotiate a price within your budget. We combine shipping and ship worldwide. If you have any questions, comments, or concerns; please contact us immediately and we will help you as soon as possible. Thrifty Vaultâ„¢ has focused our efforts in helping others! We have always reached out a helping hand to those in need and realized that our services are needed more then we could have ever imagined. After launching our seller/buyer network at thriftyvaultshoppers.ning.com and getting feedback from all of our members and seeing how hard it is for online sellers from first hand experience, we decided to help even more. We are now helping other sellers stock their stores with high quality and in demand items for great low prices so they can make a profit! We have also extended our advertising packages to a wider audience and help sellers get traffic to their stores. The key is great products and traffic and we can help! The larger the advertising package the more traffic you will get. Make sure to have your online store ready for the traffic with great products and prices! We will also offer advice when needed! If you have any questions, comments, or concerns; please contact us immediately. As always, we are only a click a way and here to help! All items are brand new and ship within 7-14 business days. This excludes weekends and holidays. All items are listed while in stock, because of large demand, item quantities available may be different then listed above. If item is out of stock upon packaging process, you will be notified immediately and refunded. To inquire about quantities available, email samantha@thriftyvault.com with item title in the subject header. You should receive a response within 48 hours on weekdays and before the following Tuesday for weekends. All orders are shipped via first come first serve basis and all emails are answered by order received. Customer Service is ready to help you with all your questions, comments, and/or suggestions. 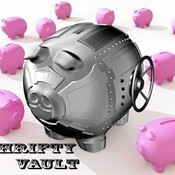 Please feel free to contact us at thriftyvault@gmail.com! All sales final unless DOA (Damaged On Arrival). Exchange for like pair only. No size exchanges. We ship via UPS to the 48 continental states and by US Postal Service. We combine shipping on ALL orders. International Rates are available upon request and customs, duties, taxes are NOT included and are paid by the buyer. Do NOT request that we mark your item as "gift", under no circumstance will we break the law in any way. Buyer is 100% responsible to be 100% available for whenever FedEx makes the delivery. If buyer misses the delivery and the order is returned to us, then the customer must prepay the exact amount for the two way shipping before we can reship that order. If buyer does not request reshipping, and the order is replaced back into stock, then the customer is billed: a 20% "order processing/pulling & order reprocessing/restocking" fee; plus the two times the FedEx shipping charge, minus the initial payment. Orders are processed in the order that we received a cleared payment and other requested information. We ship as as soon as possible. We are not obligated to make delivery on any specified date and assume no liability for damages due to any delay or inability to fill orders. All first orders over $350 paid by credit card might be shipped to the billing/bank-confirmed address and a signature will be required upon delivery. The following rules must apply and will be strictly enforced. [A] No credit is given for any shipping and handling. [B] NO DAMAGE of ANY KIND WILL BE ACCEPTED - such as shopworn, sun-fading, finger prints, hanger marks, perfume, smoke or cosmetic smell, writing on hang tags, worn or washed items, etc. [C] All original tags, bags, wrappings, display boxes, shoe & boot boxes, hangers, etc. must be returned as new. [D] Merchandise sold by: the dozen, or unit in packages, or displays, must be returned full, not partially sold. [E] Merchandise that does not meet the above standards will not be credited or processed and the sender will have to pay shipping charges in advance to have the box returned. Uncalled for merchandise will be discarded after 30 days. In case of DOA (Damaged on Arrival) to our fault, we are not responsible for damage caused by shipping. You must pre-purchase insurance for your package to insure it. To claim insurance, you must contact FedEx yourself and follow their rules and procedures on such situations. Thrifty Vault has no say in how FedEx handles its claims. The policies in this listing void all other policies mentioned throughout our website. Please note that filing a false dispute with Paypal, Google, or doing a Chargeback on your Credit Card, Issuing worthless Checks, or Fradulent Money Orders will have your account blocked from buying with us. We will strictly enforce all policies and you the buyer are aware and accept the policies listed above when checking out. We will proceed with legal action as the law allows for any false disputes, theft by chargebacks, issuing worthless checks, and/or issuing fradulent money orders. We will work with law enforcement to recover stolen goods and will provide all personal and business information as needed. There is a $25.00 NSF fee on all returned checks. In such cases you waive your confidentiality agreement on all orders, either adult or otherwise, and release us from any such agreement in the cases of fraud, theft, or falsifying reports, and/or filing false disputes, etc. Please contact seller immediately if you have any questions, comments, or concerns. We are more then willing to help you and make sure that your experience shopping at Thrifty Vault is a pleasant one. If you have had a 5 star and beyond experience, please leave positive feedback. If you have not, then please contact us immediately so that we can find a solution to the problem. We pride ourselves on excellent customer service and want you to have the best possible shopping experience on the internet! samiamsxa doesn't have any items in their booth! I can wholeheartedly recommend Sami…I’ve bought some great stuff and was quite pleased with the transactions. Asset to Bonanza! Sami always has the coolest stuff! she’s hip to the trends, friendly and so helpful! You can trust Thriftyvault for the best service and products! Sami goes above and beyond for me and all her customer’s. Sami offers great “Advertising Packages” (i just purchased my third one); that i believe are a must have for Seller’s that want to get more views and sales to their Booth’s. She is dedicated to customer satisfaction! I highly recommend this wonderful seller! Always helpful and provides excellent customer service. I highly recommend her both as a buyer and seller. What a pleasure it is to work with Sami! She has great items, try her advertising packages for a boost in sales! She is honest, and always works hard to help her fellow sellers! Great person, trusted! Buy from thriftyvault! Iâ€™ve purchased from samiamxsa several times and always had a fantastic transaction. She is an excellent seller her products are terrific. You will love it here! I feel the need to give due credit to this hard working lady! Sam you’re on of the best. Your advetising package was one of the best investments I’ve made recently. Thank you for everything you do!!! Samiamsxa is a valuable asset to Bonanzle. She has been a Bonanzle seller since 2009. Everyone knows how they can trust her judgment and values her experience. Make â€œsamiamsxaâ€ a favorite on your list as she has a variety of merchandise and should be a first choice for looking at what you might need. Sami is has a “Plus Membership” which shows her fellow Bonanzlers and buyers that she is a supporting Bonanzle member. Sami offers great products and is dedicated to customer satisfaction! I highly recommend this wonderful seller! Sami’s a great person to deal with. She has a lot to offer her customers and does it with a great personal touch. I highly recommend her to everyone looking for that something special. I am so pleased to recommend samiam to anyone! She is top notch! Very professional, courteous, just an all round great seller and a wonderful person as well. She is one of the best and you will be treated like a star at her booth! Shop with confidence! I am so happy to have the chance to endorse Sami! I have had the pleasure of buying from her and let me tell you, she is tops! You will be treated like royalty with this seller, she will do whatever it takes to make her buyers happy! Nice stuff. Nice to see you here. It has been a pleasure working with Sami…She is a hard worker and aims to please. I’m so glad to have chosen her to do business with, and to have made her aquaintance…I recommend her highly….I will be back http://www.bonanzle.com/images/emoticons/smile_7.png! This very nice lady is very PROFESSIONAL.I have bought from her and her items are very NICE.I RECOMMEND her to ANYONE needing GIFTS. She is always ready and GUYS this is the place to be for VALENTINE’s orders. I STRESS HIGHLY RECOMMENDED!!! PURE HAPPINESS HERE!!! I can highly recommend this wonderful seller….I’ve known her for a very long time on another venue and she has proven to be honest and completely trustworthy is every way. It really doesn’t get any better than this folks! Hi Sami! Great seller that I’ve had several transactions with! Always fun & interesting items that make you smile! As does she! You will not be disappointed buying here! Sami is a devoted friend and as a seller she treats you with respect & kindness and gives great service. You can buy with confidence here! Sami!! WOW I am so glad to see you here! This is a great seller and buyer that I have had great transactions with for a long time on other sites! Please shop with confidence! !